Scott has Cherokee and Blackfoot heritage and was trained in the ancient traditions of the Anishinaabe by Bear Walker, helping him on his path as a medicine man. He has studied the art of sacred drumming with the late August, (Augie) Cardinale. He cherishes his traditions in the native ways of life and seeks every opportunity to teach and learn. He is a sacred pipe carver and pipe carrier honoring the traditions of the White Buffalo Calf Woman. He is a gifted healer drawing on his connection with spirit and elemental medicines, a true hollow bone channeling the Great Spirit’s gifts for the greater good. 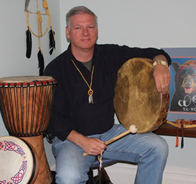 Scott holds monthly Drumming Circles to help raise the vibrations of the individuals present and to re-connect to the tribal beat like unto a heartbeat. Each of us has a vibration within that yearns to connect with outside vibrations. We find it in music, walking, meditations and in nature. The drum is our outside heartbeat. Loud and booming or soft and rhythmic it reflects what beats within. His drumming circles allow the beats of the community to join together in a cohesive song of love and release. Amazing shifts in consciousness have been known to happen as the feeling of oneness goes through you in the vibrations. So, come join the circle and share your sacred beat with others while feeling the good vibrations of community.